In the conventional theory of the firm, the principal objective of a business firm is to maximize profit. Profit maximization is the main aim of any business and therefore it is also an objective of financial management. Under the assumptions of given taste and technology, price and output of a given product under competition are determined with the sole objective of maximization of profit. 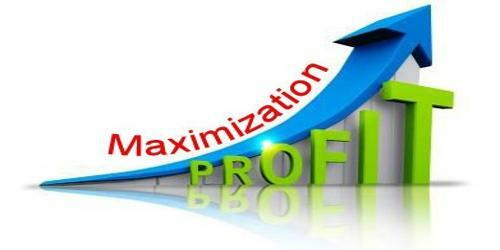 Profit maximization refers to the maximization of dollar income of the firm. It is the traditional approach and the primary objective of financial management. Under profit maximization objective, business firms attempt to adopt those investment projects, which yields larger profits and drop all other unprofitable activities. It implies that every decision relating to business is evaluated in the light of profits. In maximizing profits, input-output relationship is crucial, either input is minimized to achieve a given amount of profit or the output is maximized with a given amount of input. The objective of Profit maximization is to reduce risk and uncertainty factors in business decisions and operations. Thus, this objective of the firm enhances productivity and improves the efficiency of the firm. Profitability of the firm is an important indicator of its financial stability as well as economic well being. In a competitive market, only those firms survive which are able to make a profit. Hence, they always try to make it as large as possible. All other objectives are subjected to this primary objective. Profit maximization objective is a time-honored objective of a firm and evidence against this objective is not conclusive or unambiguous. Increased profits promote socio-economic welfare of various stakeholders associated with the firm. It helps shareholders wealth maximization increased incentives and benefits to employees, better-improved products to customers and employment generation. Though not perfect, profit is the most efficient and reliable measure of the efficiency of a firm. Under the condition of the competitive market, profit can be used as a performance evaluation criterion, and profit maximization leads to an efficient allocation of resources. It leads to proper and efficient channelization and utilization of surplus funds for productive business operations and other economic activities. Profit maximization objective has been found extremely accurate in predicting certain aspect of a firm’s behavior and trends; as such the behavior of most firms are directed towards the objective of profit maximization.